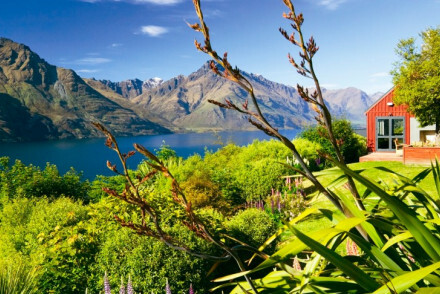 Queenstown is well known for the adventures offered right on its doorstep, on the stunning surrounds of Lake Wakatipu and the peaks of The Remarkables. These make the perfect backdrops to try your hand at bungy jumping, skydiving, jet-boating, skiing or playing golf - at one of the five international standard golf courses. Once you’ve packed as much adrenalin into your day as possible it’s time to enjoy the collection of cosmopolitan bars and restaurants, many of them part-fuelled by the wonderful local vineyards. Queenstown has a reputation for being open all hours, and you’ll often see people returning from their evening out at five or six in the morning. You’ll find the best places to stay in Queenstown scattered around the town, around the lake, and, if you prefer a bit more peace and quiet, just out of town. If you’re looking to blend your adrenalin pumped days with some relaxation you might want to play some golf, or fish - Lake Wakatipu is well known for its trout , do some walking in amongst the wonderful scenery and maybe take a cruise on the lake. Queenstown also has very beautiful Gardens, set on a little jut of land protruding into the lake. Queenstown offers horseback treks, scenic flights in both helicopters and light aircraft, a luge track down the mountainside and there’s an Underwater World. And then of course in winter there’s the skiing and the Winter Festival. go on a zipline trek and play on the different trails of the Queenstown Bike Path, which run down hill from the top of Bob’s Peak. The best places to stay in Queenstown are busy year round, due to the range of activities in the region, so don't leave it till the last moment. Get organised and book early! Azur Lodge is a collection of nine villas, just five minutes drive from Queenstown, but right on the shores of Lake Wakatipu, with views across the lake to The Remarkables beyond. Each villa has floor to ceiling windows and living and dining areas, and the whole place feels tranquil and secluded. The Spire Hotel has just ten suites, with wooden shutters, stone clad fireplaces and lots of other luxurious details. There’s also a cocktail bar, a restaurant and access to a gym and a garden. 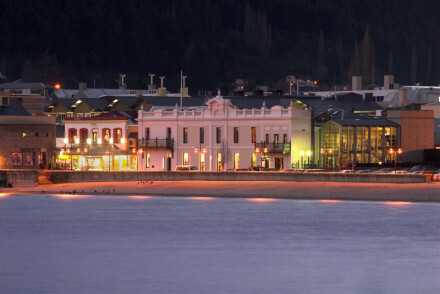 And you’re in the centre of Queenstown, within walking distance of restaurants, cafes, bars and the main sights. 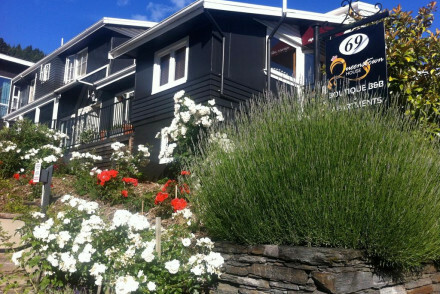 Eichardts Private Hotel is a small, but very luxurious hotel on the shores of Lake Wakatipu. There are just ten chic, designer rooms and a gym, bar and restaurant serving seasonal local cuisine. The views are wonderful and you’re still close to the highlights of Queenstown. The 34 room Melbourne Lodge offers a choice of rooms, suites and apartments starting from just £72 per night. As well as the clean, modern, functional rooms. Breakfast is included. And you’re right in the centre of things come the ski season. 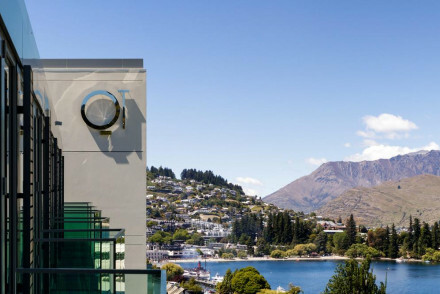 Queenstown House overlooks Lake Wakatipu with the Southern Alps in the background and offers a choice of ten luxurious apartments and B&B rooms. There’s local art on the walls above stone fireplaces, and there are peaceful outdoor decks for enjoying the views. Matakauri Lodge has a stunning spot on the shores of Lake Wakatipu, and each of its 16 rooms, villas and suites have private balconies or decks from which to take full advantage of the stunning views. There’s also a heated outdoor infinity pool, a gym and a spa, and you’re just seven minutes drive from Queenstown. 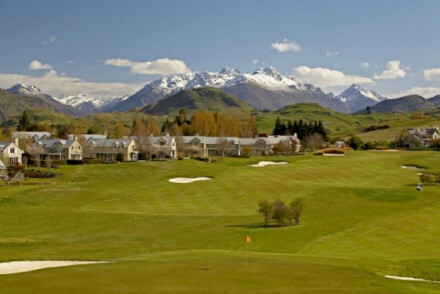 The Millbrook Resort is around 20 minutes drive from Queenstown, set on its own 500 acres of land, which includes a golf course. There is a range of self-catering cottages and suites decdorated in modern style. Guests can also enjoy the spa, indoor pool and choice of four restaurants. Villa Del Lago is a collection of 16 fully serviced suites and apartments with outdoor patios or balconies and gas fires. As well as being right by the lake, you’re also near the Frankton trail. If you prefer your accommodation small and boutique, try The Arrow Private Hotel. A five suite hotel in the historic mining town of Arrowtown, just 20minutes from the ski fields. There’s local art on the walls, panoramic views and a relaxed, alpine feel. Evergreen Lodge has just four rooms, but they’re luxurious, with wonderful views of Lake Wakatipu and The Remarkables beyond. There’s a dining area, gym, sauna and laundry room, so while it’s small you’re not skimping on facilities. 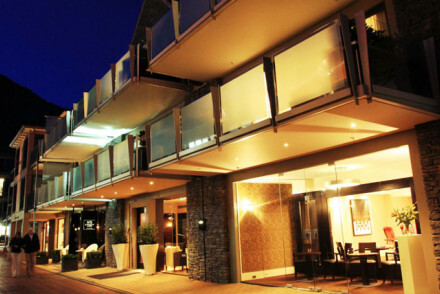 The Queenstown Park Boutique Hotel is a little larger, with 19 rooms. Inside this luxurious hotel you’ll find some wonderful, locally designed furniture and art and a green attitude. You’re also close to town and have great alpine views. Fly to Queenstown Airport serviced both across New Zealand and internationally. Alternatively a number of buses run daily from Christchurch, Dunedin, Invercargill, Te Anau, Wanaka and the West Coast. The best time to visit Queenstown for warm weather is the summer (December through February), when the long, sunny days make outdoor excursions enjoyable. Also visit Mid-June to early October for the winter sports. Browse through our list of all the best places to stay in Queenstown. Widen your search and check out all our South Island recommendations. A range of rooms, suites and apartments to suit varying budgets in the centre of Queenstown. Clean, modern, friendly and functional, with free breakfast. A superb base for a winter stay with a choice of ski areas, not forgetting the winter festival, pure mountain mayhem! Ideal for larger groups. 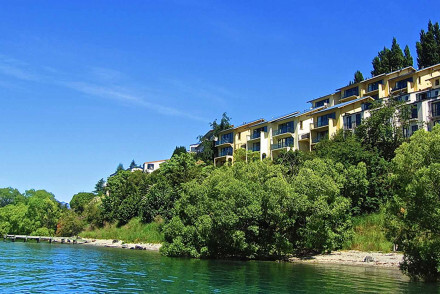 Luxury apartments and B&B overlooking Lake Wakatipu to the distant Southern Alps. With stone clad fireplaces, local NZ art on wall, comfy double beds and private outdoor decks. An ideal base for exploring region, including skiing in Coronet Peak or The Remarkables (June to October) and hotsprings. A range of self catering cottages and suites situated on the 500 acre Millbrook Resort with a 27 hole golf course. Decor is contemporary, modern and slick. Cottages come with private verandas and dining areas. Also has a spa, indoor swimming pool and choice of four restaurants. Set in the historic gold mining town of Arrowtown, this boutique hotel offers five luxury suites designed to be in harmony with the alpine surroundings. 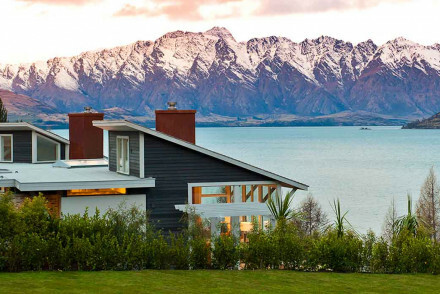 With local NZ art, king-sized beds and panoramic views. Twenty minutes from Coronet ski field, with ski storage facilities. A peaceful place. 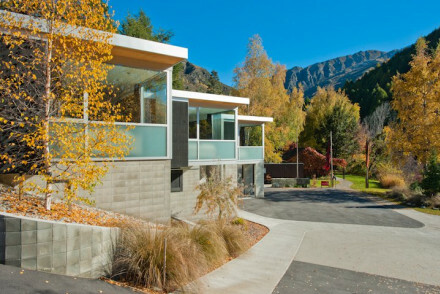 Luxurious boutique hotel in Queenstown with under-floor heating, New Zealand made and designed furniture and glass walled bathroms. Great alpine views, close to town centre and committed to eco-friendly practices. Fully serviced modern suites and apartments in Queenstown with kitchen, laundry, dining and sitting areas. Features such as gas flame fires, outdoor patios, balconies and free unlimited wifi. Family friendly, and close to Frankton walk and cycle trail. 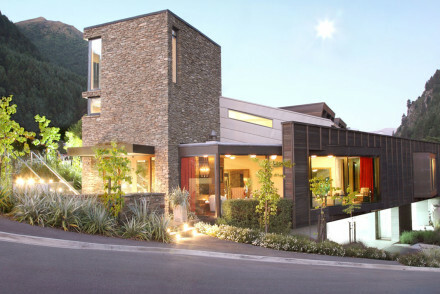 Clean, comfortable and luxurious five star accommodation with wonderful unobstructed views over Lake Wakatipu. With a gym, sauna, laundry room and outdoor dining area. Ideal for a relaxing stay away from the bustle of the town. 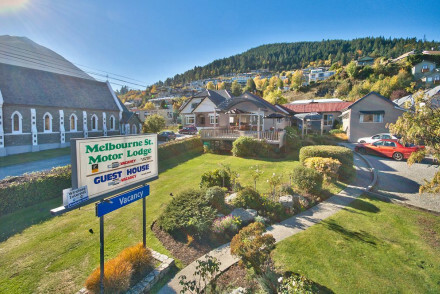 Luxurious hotel conveniently located in beautiful Queenstown. Rooms offer stunning views over the lake or mountains. Feast on delicious international-fusion cuisine and sip cocktails at the chic bar. Features a neat heated plunge pool and sauna. A spoiling base to explore this beautiful region. Luxury lodge with wow factor in stunning location just seven minutes drive from Queenstown on Lake Wakatipu. Range of villas and suites available, all with private balconies and decks with views to distant mountains. Heated outdoor infinity pool, gym and spa. Blissful country escape. Ten luxurious modern suites with stone clad fireplaces, wooden shutters and fresh flowers in rooms. With a cocktail bar, restaurant, access to a gym and garden. 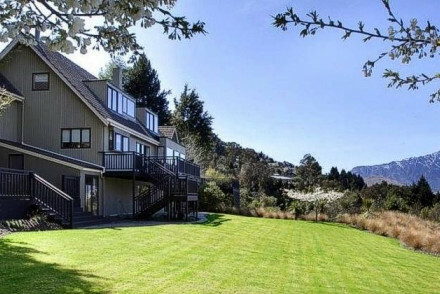 In centre of Queenstown within walking distance of restaurants, cafes and sights. Spectacular views from this luxury hotel on the shores of Lake Wakatipu. Chic designer decor bringing warmth and style with open fireplaces and comfy beds. Ski storage, a gym, bar and restaurant serving local seasonal cuisine. Ideal for browsing in the designer boutiques and taking in the city. Open plan apartments with floor to ceiling windows, glass doors and open plan layout including dining and living areas. Stunning views across Lake Wakatipu to The Remarkables and Cecil and Walter Peaks, only five minutes to Queenstown. Perfect for a romantic getaway.